I have used the ziplock bag to create different designs for my nail art, check out the tutorials here and here. This time I experimented with creating my own hand painted nail stickers for Halloween. 1. Apply a top coat, I used Seche Vite, in a small square. I applied about five layers, it must to thick so you can peel off later. 2-4. 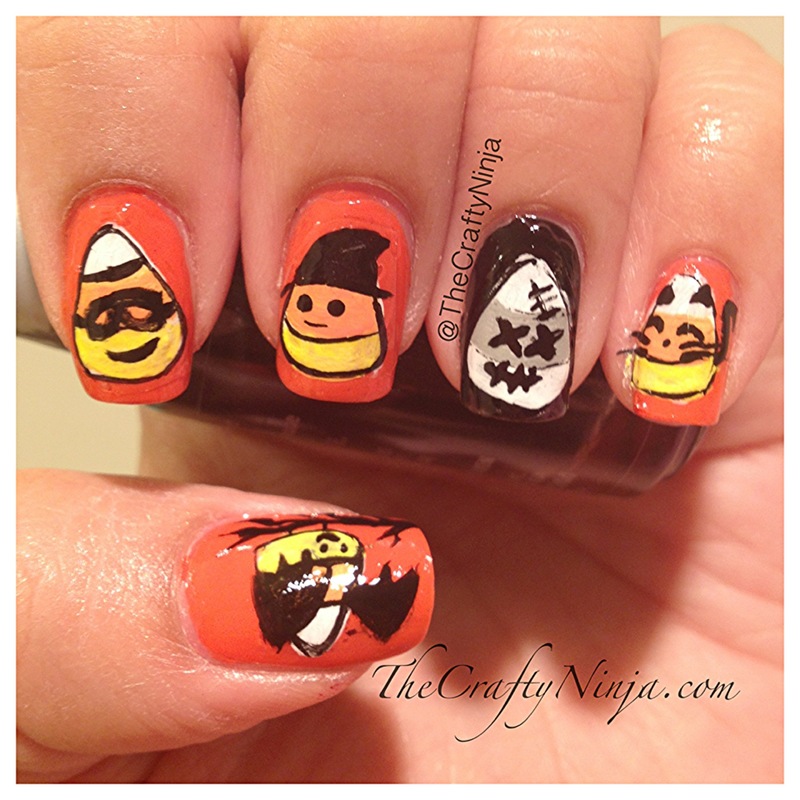 On top of that dried top coat, I painted the candy corn design with acrylic paint. 5. I used Orly Instant Artist to create the details of the Candy Corn Halloween characters, sorry no steps on how I drew the characters. Let it dry. 6. Using tweezers I carefully pulled the characters. Using scissors I cut the clear top coat around the candy corn sticker down to size to fit my finger nail, step not shown. 7. Apply top coat on your nail, this will act as the glue. The base color should be completely dry. 8. Apply the candy corn sticker on the nail and lightly press. If you press down too hard or too long the design will get tacky and stick to your fingers, so work quickly. 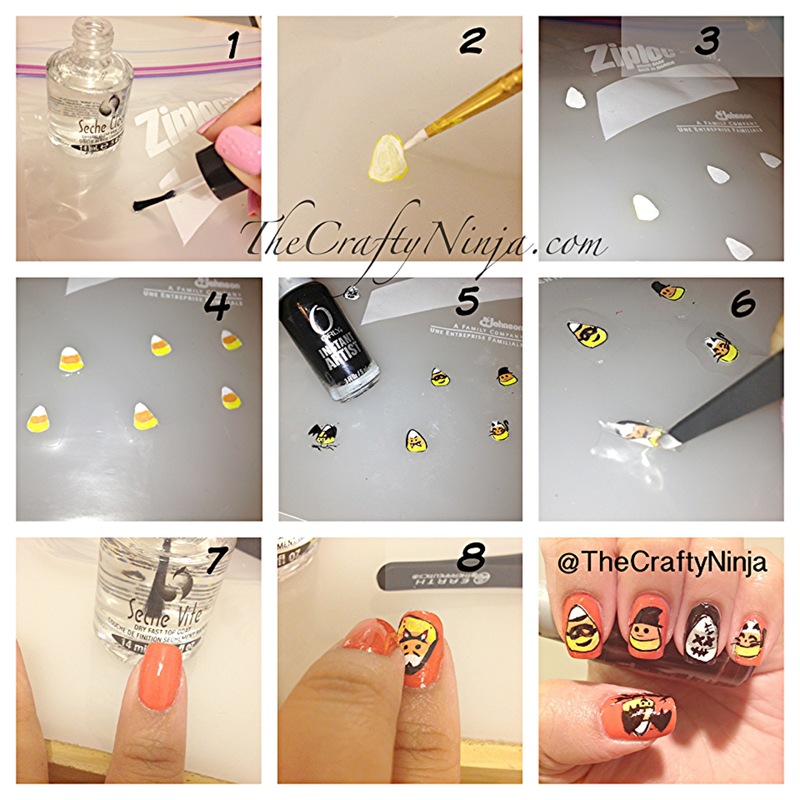 Finish off by applying the top coat on top of the nail sticker to seal and protect.